Are you stumped for a terrific gift for your Valentine this year? How about tickets to a great Concert, or maybe even an AMT Gift Card! Here are a few ideas we think your Valentine would love. Looking for an evening of nostalgia or romance? Why not come see The Golden Boys on February 19, Frankie Valli & The Four Seasons on May 17, or Johnny Mathis on May 19? How about a night of country music? Consider Wynonna & The Big Noise on March 1, Montgomery Gentry on May 11 or George Jones on June 3. Is classic rock more their style? America & Jon Anderson on February 17 or Three Dog Night on April 1 are great choices. Maybe your Valentine would prefer a night of comedy. We suggest Bill Cosby on February 18 or Brian Regan on September 27. Also, don’t forget about our AMT Original Shows – Country Classics, opening May 2, American Icons, on stage starting July 26, and the all-new 2012 Christmas Show, debuting November 1. With so many Concerts and Original Shows to choose from, maybe an AMT Gift Card is right for you. Not only will your Valentine love you for your thoughtfulness, but they’ll be able to select the show that suits them best. 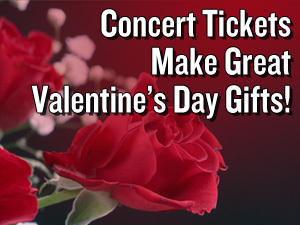 Concert tickets and Gift Cards to AMT are the perfect Valentine’s Day choice. Unlike candy or flowers, they’re non-fattening and the petals won’t fall off!